. Correcting Atoun's characterization of the status of Sayf al-Adel and Abu Muhammad al-Masri (Zawahiri's two deputies present in Iran).
. Explaining why he withdrew support for the Jabhat Fatah al-Sham project.
. Accusing Atoun and Hay'at Tahrir al-Sham of breaking the allegiance and disobeying/rebelling against Zawahiri.
. Attacking Atoun's characterization of the system of correspondence and problems of betrayal of trust as particularly unwarranted and egregious. Correcting the example Atoun gave of a message supposedly reaching Abu Julaybib before it reached Abu Muhammad al-Jowlani.
. Concluding with an urgent call for the mujahideen in al-Sham to unite, because of the global war against Islam.
. As a final note, denying links to or special knowledge of an al-Qaeda 'loyalist' group called Ansar al-Furqan that is rumoured to have been established in Syria. Interestingly, in characterizing Hay'at Tahrir al-Sham's disobedience/rebellion against al-Qaeda, Abu al-Qassam quotes a well-known poem by Ma'an bin Aws, a poet who was said to have been born in the time before Islam (al-Jahiliya) but converted to the religion and lived beyond the Prophet Muhammad's death. 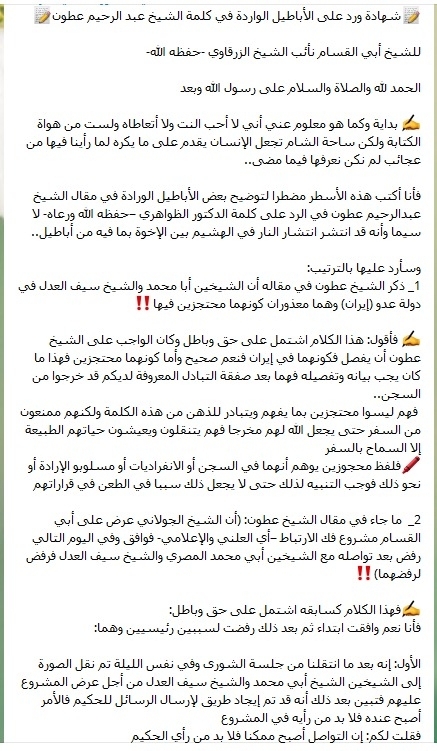 Note that in publishing a version of his internal essay, Atoun appears to have made a correction on his claims regarding a message that supposedly reached Abu Julaybib before it reached Jowlani. 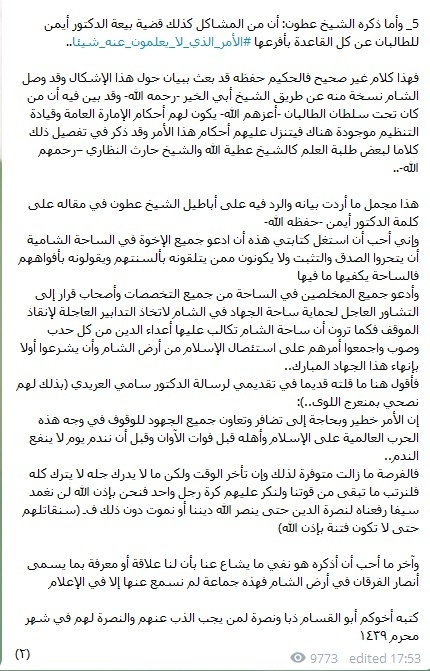 Below is the text of Abu al-Qassam's testimony with translation. Testimony and response to the falsehoods that came in the words of Sheikh Abd al-Rahim Atoun, by Sheikh Abu al-Qassam the deputy of Sheikh Zarqawi (may God protect him). To begin with, and as is well-known about me, I do not like the Internet, am not involved with it, and I am not among the fans of essay-writing, but the field of al-Sham makes man do what he hates on account of what we have seen in it from strange things we did not know of in what has come to pass. For I write these lines compelled to clarify some of the falsehoods that came in the essay of Sheikh Abd al-Rahim Atoun in responding to the speech of Dr. Zawahiri- may God protect him and guide him- especially as the fire has spread in the straw among the brothers on account of the falsehoods in it. 1. Sheikh Atoun mentioned in his essay that the two sheikhs- Abu Muhammad al-Masri and Sheikh Sayf al-Adel- are in an enemy state (Iran) and the two of them are excused as they are detained in it!! I say: these words included truth and falsehood and it was necessary for Sheikh Atoun to set forth in detail, for the fact that they are in Iran is true, but as for being detained, this was what had to be clarified and detailed: for after the exchange-deal well known among you, they got out of prison. So the two are not detained as is understood and implied from this word, but they are prohibited from travelling until God can grant them an exit, for they move about and live their ordinary life except for permission to travel. For the word 'detained' gives the false impression that the two are in prison or incommunicado or deprived of will or the like. So it was necessary to warn about that so that it is not made a reason to attack their decisions. 2. What came in Sheikh Atoun's essay: that Sheikh Jowlani displayed to Sheikh Abu al-Qassam the project of breaking ties- that is, publicly and in media- and he agreed and on the next day he rejected after he connected with the two sheikhs Abu Muhammad al-Masri and Sheikh Sayf al-Adel, so he rejected because they rejected!! These words, like the preceding, contained truth and falsehood. First: after we moved from the Shura meeting and on the same night the picture was transmitted to the two sheikhs Sheikh Abu Muhammad al-Masri and Sheikh Sayf al-Adel in order to display the project to them but after that it became clear that a means had been found to send messages to the hakim [Zawahiri] so the matter became in his hands and his opinion on the project was required. So I told you: if connection has become possible, the hakim's opinion is necessary. Second: after displaying the matter to the two sheikhs Abu Muhammad al-Masri and Sheikh Sayf al-Adel it became clear to me that the two reject the project and they are among the three deputies of Dr. Zawahiri- may God protect them all. So Sheikh Abu al-Khayr- may God have mercy on him- initially agreed with it but after the first message of the hakim, he ceased to go forward with the project until the hakim should agree to that, for it appeared to him that the matter is not among his competencies, and the two sheikhs Abu Muhammad al-Masri and Sheikh Sayf al-Adel rejected the project. And since the matter among them is by majority as is well known I desisted and rejected that, for the matter on the level of an organization should not have been carried out for reasons I mentioned, so I withdrew my agreement and said that the matter is now in the hands of the general leadership and is not among the competencies of the deputy or branch. And note that after the hakim's first message the matter became as Dr. Sami al-Oraidi- may God protect him- mentioned: the general amir, the second deputy and the third deputy reject the project while the first deputy ceased to go forward with the project until agreement from the hakim should come to him. 3. Atoun mentioned that a group of people are causing disorder, attacking and finding attentive ears among some of the leadership and this is the most important factor in the problem, and were it that they had disagreed with us on the basis of the al-Qaeda issue the matter would have insignificant, and the truth is they have found the al-Qaeda issue as a cloak and cover to wear to realize what they desire!! In truth, allow me to tell you oh Sheikh Atoun that this is from the great slander against the leadership! Before there should be an attack on that group of whose existence among us we do not know except from your words here, and perhaps it is among your delusions, may God correct us and you! For all know that the field of al-Sham does not have anything covered in it. Everything is broadcast as soon as it happens, for your words and deeds do not need anyone to transmit them. It suffices for you to look at the Internet to know the truth of my words and the falsehood of your words. And the leadership reads, heard and tracks all the fields, not just the field of al-Sham. But the issue in the field of al-Sham is exposed to every follower of it, so how can it be hidden from the leadership? So is it the fact they did not agree with you on your project that you describe them as attentive ears?! For it is an ear of good- as we reckon it and we do not vouch for it over God- that listens to all and decides what it sees as best for the jihad and mujahideen in general and advices to protect the field and not stir up internal quarrels in it. And these ears are an ear of good, not recent in jihad, for the age of many of them in jihad is older than your age since your birth until now, so they have been on jihad since before you, oh Sheikh Atoun, were a clot or lump of flesh. And it is an ear of good that has bonds in the path of jihad, fighting and waging jihad and advising and guiding until God has destined acceptance for them, and for the sake of this acceptance, you wore their clothes and were called by their name so when your fame spread and you thought yourselves as having become qualified for the leadership, you broke your allegiance and disobeyed [/rebelled against] your amir, you said in speaking for your state of affairs: we have heard and disobeyed. Then you say oh Sheikh Atoun: attentive ears!!! Teaching him magnanimity every time, but when his moustache grew, he shunned me. And how often did I teach him the system of poems, but when he said a poem, he ridiculed me!! 4. Sheikh Atoun was not content in his words with putting the leadership in a bad light, but also he went beyond his limit and stirred up distrust, for he attacked the brothers who are responsible for connection, and this is a matter that aroused my surprise and bewilderment, and it aroused the surprise and bewilderment of most of the brothers, for Sheikh Atoun made a statement and blacked his page through his characterization that there is a problem in the means of connection itself as there are some of the correspondents who open messages and send copies of them or keep them and he described the one who does that as 'betraying trust' and he cited as an example of that the claim that the first message reached Abu Julaybib before reaching Jowlani!! In truth I am shocked that these words come from you oh Sheikh Atoun, for that by which you have blackened your page has no origin in truth from first to last! How have you taken it upon yourself oh Sheikh Atoun to attack the brothers without evidence or proof and you describe them as betraying trust?! For what we know about the brothers is that they are a people of ethics, religion, trust and fairness and they are among the best of the mujahideen and they were chosen as a precise choice for this task within distinguished qualities. What you have claimed about the message having reached Abu Julaybib before reaching Jowlani is false and Abu Julaybib denies that in whole and in detail, so ask him. Regrettably, Sheikh Atoun, these words of yours and the likes of them are what encourage many of those around you to attack those who disagree with you with charges of which they are innocent and have no evidence and basis. For we hear how you describe us and how you circulate it among yourselves but we pass over it in review, for it does not concern us that you attack our individual personae for this is what we donate to our adversaries. But that you should prod and slander the leadership then take it upon yourself to attack explicitly, without evidence or proof, those entrusted with connection. This is what one must not be silent about. 5. As for what Sheikh Atoun mentioned: that among the problems likewise is the issue of Dr. Ayman's allegiance to the Taliban on behalf of all al-Qaeda and its branches: the matter about which they know nothing. These are untrue words, for the hakim- may God protect him- sent a statement about this problem and a copy of it reached al-Sham through Sheikh Abu al-Khayr- may God have mercy on him- and in it he made clear that whoso is under the authority of the Taliban (may God make them mighty), for them are the general rulings of the emirate, and the leadership of the organization is present there, so upon them come the rulings of this matter. And in detailing that he mentioned the words of some of the students of 'ilm like Sheikh Atiyyat Allah and Sheikh Harith al-Nadhari (may God have mercy on them). 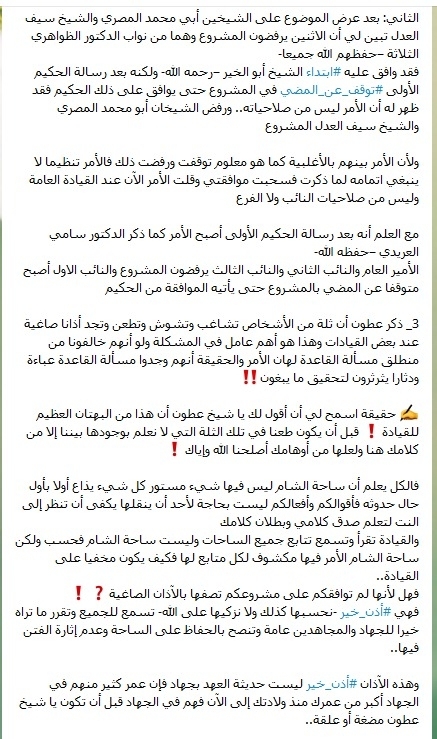 This in sum is what I wanted to affirm and say in response to the falsehoods of Sheikh Atoun in his essay on the speech of Dr. Ayman, may God protect him. And I would like to take the chance of my writing this to call on all brothers in the field of al-Sham to pursue truthfulness and certainty and not to be among those who receive it in their tongues and say it with their mouths, for what is in the field suffices it. And I call on all those with pure intentions in the field from all specialties and decision-makers to urgent consultation to protect the field of jihad in al-Sham to adopt urgent measures to save the position, for as you see that the enemies of the religion from all directions have gathered against the field of al-Sham and have brought together their affairs on wiping out Islam from the land of al-Sham and beginning first by ending this blessed jihad. Indeed the matter is dangerous and in need of the coordination and cooperation of all efforts to stand in the face of this global war on Islam and its people before time is up and before we regret a day in which regret is of no use. For the opportunity is still available for that even if the time is delayed, but what cannot be completely attained must not be completely abandoned. So let us organize what remains of our force so let us attack them as though we were one man, for we by God's permission will not sheathe the sword we raised to support the religion until God gives victory to our religion or we die without that, so we will fight them until there is no more fitna by God's permission. The last thing I would like to mention is to deny what is spread about us that we have a link or knowledge of what is called Ansar al-Furqan in the land of al-Sham, for this is a group we have only heard of in the media. Written by your brother Abu al-Qassam to defend and support the one those who must be defended and supported in the month of Muharram 1439 AH.